The Seneca County Department of Planning and Community Development and the Wayne County Planning Department are together hosting an evening of free training sessions with land use training specialists from the New York State Department of State. The conference will bring together canal enthusiasts, historians, developers, elected officials and others to exchange ideas and learn more about the Erie Canalway. In 2011, the Town of Montezuma received word it had been selected by Parks & Trails, NY to receive technical assistance from staff through their Healthy Trails, Healthy People program. This program is aimed at helping New Yorkers develop more active communities with recreational, economic and quality of life benefits. Please register by August 15, 2014 by calling (315) 252-4171, extension 3. Please register by August 15 by calling (315) 422-8276, extension 212 – Jeanie Gleisner, CNY Regional Planning & Development Board. This land use policy workshop describes practical, proven, market-based techniques for protecting rural character and community-wide open space networks through “conservation design” principles in updated zoning and subdivision regulations. Examples illustrate how thousands of acres have been conserved in this manner, at no public cost, and without negative impacts on landowners. 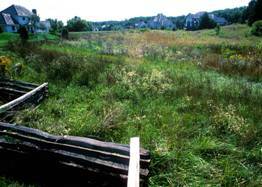 We previously reported on this blog about over $2.4 million available in grants from the United States Forest Service for the Great Lakes Restoration Initiative (GLRI). The United States Environmental Protection Agency (EPA) has also released a request for proposals for 2014 GLRI activities. The EPA plans to award $27.5 million for up to 30 projects that will control invasive species, prevent the discharge of nutrients and sediment, and improve water quality in the Great Lakes. More information is available online at 1.usa.gov/1l07JWP. Applications will be due Monday, August 25, 2014. The July Draft of the Cayuga County Agriculture and Farmland Protection Plan is now available for review. This document incorporates recommendations and suggestions from the public on the earlier draft released in May. The draft plan can be found on the project website at cayugacounty.us/agplan. A paper copy is also available for viewing at the Cayuga County Department of Planning and Economic Development offices located on the fifth floor of the County Office Building, 160 Genesee Street, Auburn, between the hours of 8 am and 3:30 pm.